Get to know yourself better through the magical energies of your Chakra system! In this 3hr workshop, we’ll look at the qualities of each of the 7 chakras through ancient & modern philosophies to understand why we act, react and move the way we do in our lives. Discover what imbalance can look like for us and learn what we can do to find inner harmony. Enjoy specially designed sequences of Yoga asana (postures), mantra (words of high vibration), pranayama (breathing techniques) & intentions for each chakra to help us feel like we’re getting reset and feel more in tune inside and out. 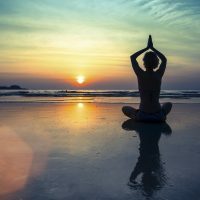 After recently completing an advanced Chakra training in Rishikesh, India, Jen is keen to share key knowledge and her own experiences of working with the subtle body to help others connect more deeply with themselves and the world around us.